Panasonic RP-CDHG15E-K review | What Hi-Fi? One star for a Panasonic product… It might have been worse had we used the official price for this cable, rather than the typical online price – £50 seems to be about £48 more than it's worth. 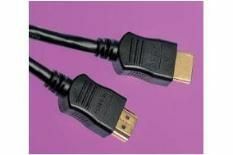 There's almost nothing to separate this from cables costing less than £2.00. It's comprehensively outperformed by the cheaper ThatCable, too – and you can have three of those for the same price as this Panasonic. No contest, then.